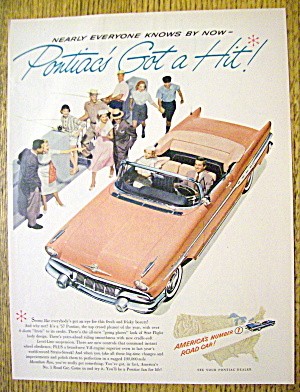 This fine vintage advertisement from 1957 for Pontiac is in good condition but is slightly yellowed. This magazine ad measures approx. 10" x 13" and is suitable for framing. This vintage magazine ad depicts a Pink Pontiac being driven by a man while a group of people look at the Pontiac.